Are you getting EXCITED for Black Friday shopping? Here’s another Black Friday ad for you to check out! Sears will be opening their doors at 6 pm on Thanksgiving evening this year and their Doorbuster pricing will last through 1 pm on Black Friday. There are two different sets of Doorbuster sales this year. All deals are available while supplies last! Most of this year’s deals will also be available on the Sears Website, too! Make sure you’re following me on Facebook and Twitter, too, so you will get the heads up when all of the Black Friday deals go live! There will be a coupon in the Black Friday ad that can be used for $10 Off Any $40 Purchase of Clothing, Intimates, Sleepwear, and Fine Jewelry. If you’re shopping Sears online, you can use the coupon code TURKEY to enjoy the same savings. Here are some of the highlights from the Sears Black Friday Ad. If you would like to view the entire 64 page ad, you can head on over here. $10 Off Your Purchase of Clothing, Accessories, Lingerie, Sleepwear and Fine Jewelry $40 or more. With in-ad coupon or Online Code “TURKEY”. Valid 11/27, 6pm – 11/28 1pm. Restrictions Apply. See ad for details. Shop Your Way Members Get $10 Back in Points When you Spend $50 or More. Valid on qualifying purchase, in store 6 pm 11/26 – 1 pm 11/28. Points redeemable 12/1 – 12/4, in store and online. 1/4 ct. tw. Diamond Earrings in Sterling Silver $24.99 With any storewide purchase of $19.99 or more. While quantities last. PNY 2200 Power Bank $14.99 Plus Members get 100% back in points. Altec Lansing Bluetooth Orbit Speaker, with clip and pouch $34.99 Plus Members get $15 back in points. iLive Bluetooth on-ear Headphones $49.99 Plus Members get $40 back in points. Samsung Blu-Ray Player $49.99 Plus Members get $5 back in points. RCA LED 1080p HDTV 40″ class $249.99 Plus Members get $50 back in points. Craftsman 9 pc. Combination Wrench Set $19.99 Plus Members get back $3 in points. Kenmore Elite Dishwasher $949.99 Plus Members get $50 back in points. Kenmore Top Freezer Refrigerator $399.99 Plus Members get $50 back in points. Kenmore 6-Speed Blender $19.99 After Mail In Rebate. Kenmore 4-Slice Digital Toaster Oven $19.99 After Mail In Rebate. Kenmore 4-Slice Toaster $19.99 After Mail In Rebate. Kenmore 12-Cup Programmable Coffeemaker $19.99 After Mail In Rebate. Vivitar Bluetooth Mini Speakers $9.99 Plus Members get 50% back in points. Vivitar Bluetooth On-Ear Headphones $29.99 Plus Members get 50% back in points. GE 29 cu ft French-Door Bottom Freezer Refrigerator $1799.99 Plus Members get 100,000 points back. LG 27 cu ft French-Door Bottom Freezer Refrigerator $1699.99 Plus Members get 100,000 points back. LG 30 cu ft French Door Bottom Freezer Refrigerator $2549.99 Plus Members get 100,000 points back. Thanks to Bargain Blessings for these Sears Black Friday Ad deals! The Sears Black Friday Ad is now available! Sears will open at 8 PM on Thanksgiving and Doorbusters will continue while supplies last through 1 PM on Friday. There will be a coupon for $10 off your $40 Doorbusters purchase in the ad! Thanks to Passion for Savings for these top deals! Sears Black Friday Deals are live online NOW! Sears Black Friday Deals are live online now! There are hundreds of doorbusters available online NOW and you can get free shipping when you spend $49 or more! You can also save $5 off a $50 purchase when you enter the code SEARS2012 at check-out. Skylanders Spyro’s Adventures Starter Pack for $49.99 shipped! Get the Skylanders Spyro’s Adventures Starter Pack for $49.99 shipped! The regular retail price is $69.99, and it is $59.99 on Amazon, so this is a great deal! Skylanders Spyro’s Adventure is an Action-Adventure game spin-off from the Spyro series designed for younger players that unlocks a whole new game universe while incorporating a unique gameplay mechanic utilizing more than 30 physical action figures that synch with consoles, creating a controllable in-game representation of that figure. The first release in the Skylander series, Skylanders Spyro’s Adventure Starter Pack contains three action figures, an exclusive game peripheral as well as other items. Action figures are compatible with all versions of the game. The game features co-op and competitive multiplayer, mini-games and more. If you are buying other items and spend $50 or more, you can enter the code SEARS2012 to save $5 off a purchase of $50 or more. 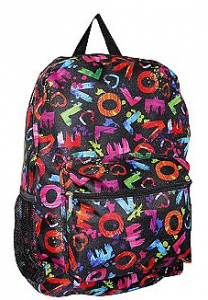 Sears has these backpacks for just $5.99! I use backpacks for my kids 72 hour emergency kits. If you don’t have a 72 hour emergency kit, this would be perfect! You can pick them up in your local store and save on shipping!